A comfortable Bar Chair is a practical marketing furniture item that will make any place feel more welcoming. Add a special touch to the promotion of your brand by ordering a branded Bar Chair in Dubai starting at 514.50 AED. Have you ever wanted promotional material that not only looks cool but is also practical? 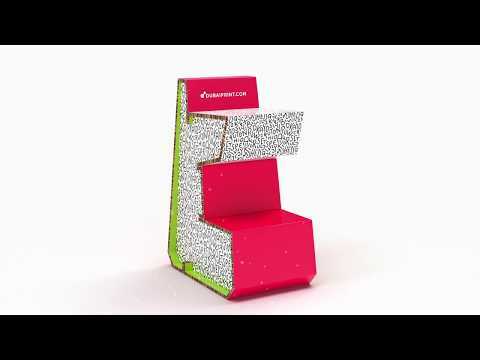 Then a branded Bar Chair made from eco-friendly D-boards is what you have been looking for. Design a comfortable and cool-looking Bar Chair to attract the attention of potential customers to your brand. Branded Bar Chairs are often used during exhibitions, trade shows, and conferences. They can serve as additions to Point of Purchase displays in stores and info desks. They do not only look cool but also serve a practical purpose. Bar Chairs that you can order from Dubaiprint.com are also special because they do not look like any of the conventional stools frequently used for promotion. A modern looking Bar Chair can change the entire atmosphere of your POS, or exhibition point, and make it feel more welcoming and comfortable. When it comes to delivery you have two options — you can either choose the custom-made Bar Chair to be delivered to your home or you can pick it up from one of our locations for free. The Bar Chair you order is going to be made from 16 mm environmentally friendly D-Board. It is the perfect material for the item not only because it is durable and stable, but also because of its elegant look. The bar chair weighs only 5 kg and is 39 cm in width, 89 cm in height, and 63.5 cm in depth. Even though our Bar Chairs are light-weight they can hold up to 100 kg of weight. The Bar Chair construction uses the interlocking system, which makes it durable and easy to assemble. For some extra stability, we recommend gluing the parts together. Our Bar Chair also comes with a template that you can use to create accurate designs. Feel free to contact our team if you need help with the creation of designs for your Bar Chair. Items of furniture — such as chairs and tables — are a necessity during public events and trade shows. They are not only part of the interior but are also a useful utility. That is why by ordering a branded Bar Chair you are using the opportunity intelligently. They have more space for branding solutions than regular Bar Chairs, and that means you can print more information about your brand. You can use the available space to give your contact information or print a beautiful pattern. That is what makes them so great! Bar Chairs are interactive and useful. People that will stop by your stand can not only look at it but also use it as furniture. So if you want to be remembered and you want to showcase your professionalism, promote your brand, and set high standards for the promotion of your corporate image, then a quality Bar Chair should be the promotional material of your choice.